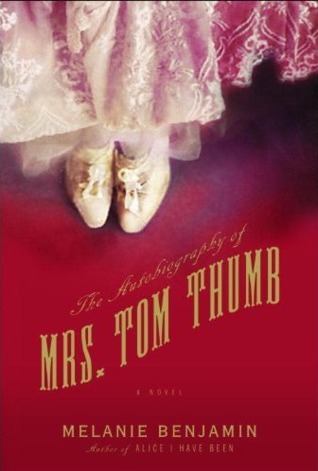 Pump Up Your Book — August Virtual Book Tour–The Autobiography of Mrs. Tom Thumb! “I did not want to be forgotten. Melanie Benjamin who debuted with her first historical fiction novel, Alice I Have Been, in 2010 has penned another stellar piece of work in the same genre with her newest book, The Autobiography of Mrs. Tom Thumb. Benjamin creates her book with such style that as you read you feel as if you’re part of a theatrical performance. As Mrs. Tom Thumb begins her “memoir” reflecting on her life, Benjamin sets the stage with the curtain rising on the world in 1841 when Vinnie was born. Benjamin interjects intermissions throughout the novel filled with historical vignettes of the times consequently giving the reader a sense for the era. Renowned all over the world as Mrs. General Tom Thumb, Vinnie –Mercy Lavinia Warren Bump Stratton Magri imparts her amazing and extraordinary story upon the reader as only she could. Why might you ask was she so astonishing and remarkable? Vinnie was a mere 32 inchestall but she always lived by this mantra: “Never would I allow my size to define me. Instead, I would define it.” (The Autobiography of Mrs. Tom Thumb,Benjamin) Instead of living a quiet unassuming life on the farm where she was born and raised with her parents and siblings in Middleborough, Massachusetts she embraced who she was and ventured out into the world. many life lessons as she travels on the Mississippi River with the rest of the troupe. The Civil War inevitably calls a halt to their journeys on the river and Vinnie once again finds herself back on her family’s farm – but not for long. Being the bright person she is, Vinnie recognizes and spearheads a plan to catapult herself to greater heights – no pun intended! This proposal includes non-other than the illustrious showman P. T. Barnum! to Melanie Benjamin as a writer. was never completely told before this. The Autobiography of Mrs. Tom Thumb by Melanie Benjamin is available for you to purchase at Amazon today! Book clubs, what a wonderful book selection for your next discussion with these reading guide questions. A special note of appreciation to Random House for sending me an Advanced Reading Copy and to Pump Up Your Book for allowing me to kick off the month of August with Melanie Benjamin’s virtual book tour! Many thanks!